Find out how to plant beautiful flowering perennials for a long-lasting herbaceous border in spring, summer and autumn. Herbaceous plants are perennials that die back in the autumn and winter, potentially leaving you with a tatty or bare flower bed, before coming back into life the following spring. To combat this, extend the season with strategic planting of shrubs and grasses for winter interest. The position may influence your choice. If your garden is shady it’s going to be more suited to woodland plants and many of these flower in the spring. If your garden is south-facing and sunny, grey-leaved plants will love this position and most flower in summer. 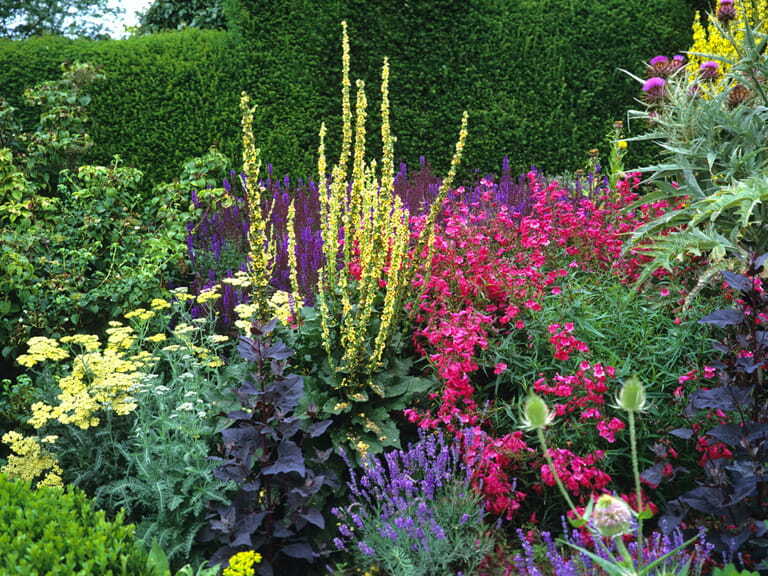 This position, or another bright position, is perfect for a summer border. An autumn border is often best in a south-west position so that the setting sun highlights the border as the days shorten. Always look out for the AGM, also known as the Award of Garden Merit, given by the RHS. It’s often depicted by a green trophy logo on the label, or the letters AGM. These will always perform well for you and the list can be seen on the internet. 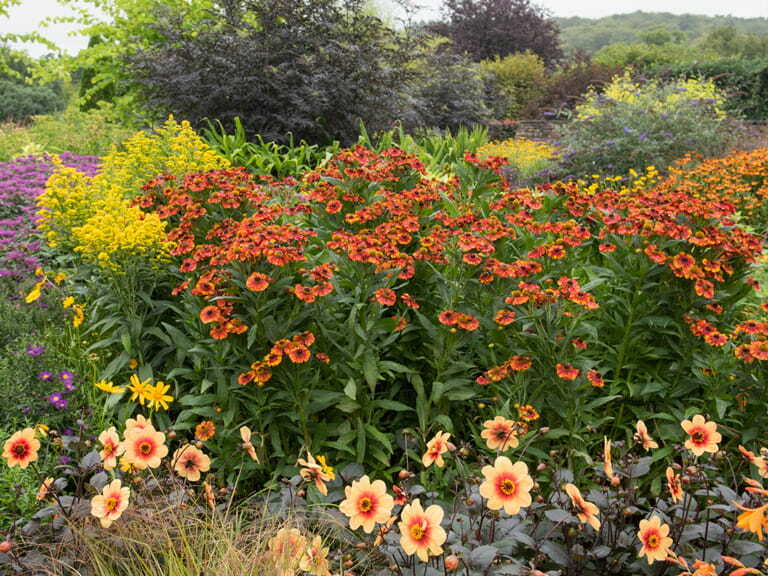 The RHS also has an extensive list of perennials suitable for a border. These are some of the best spring-flowering perennials, more suited to a shady site to create a perennial woodland border. These are some of the best summer-flowering perennials for summer-long colour. These are some of the best autumn-flowering perennials, often starting in late August and continuing to flower throughout autumn. Many people make the fundamental mistake of planting one specimen of each plant so they end up using lots of different plants. If you do this, you will create a pincushion that will look bitty and unattractive. It’s far better to restrict your herbaceous plant choices and select, perhaps ten plants, that you love the look of. Make sure that they fit into your border’s timeline so that they overlap or coincide. 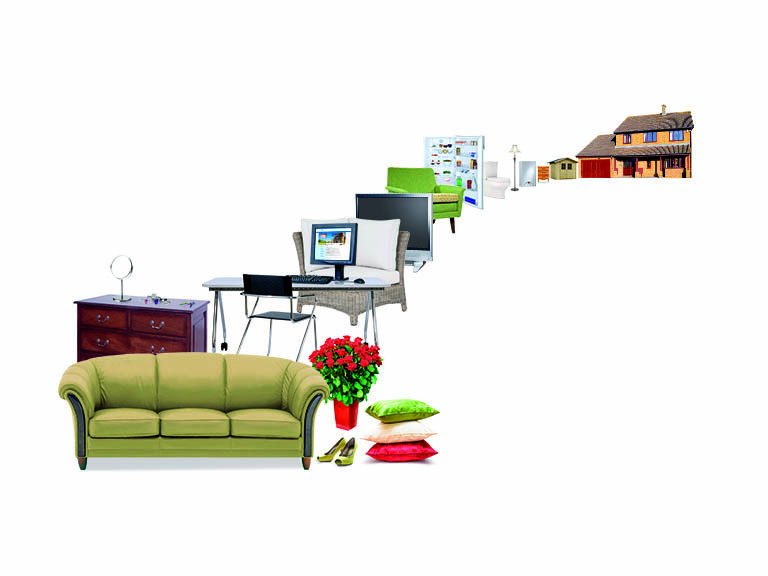 Use a good supplier and order in threes, fives, sevens or nines depending on your space. Then you’ll create a pleasing tapestry and your plants will mingle together in a natural way. It’s not more expensive to order several of one plant, because you’ll still be planting the same number of plants to fill the space. It will just look better. You may also be more likely to come across a bit of a discount when ordering more than one plant. 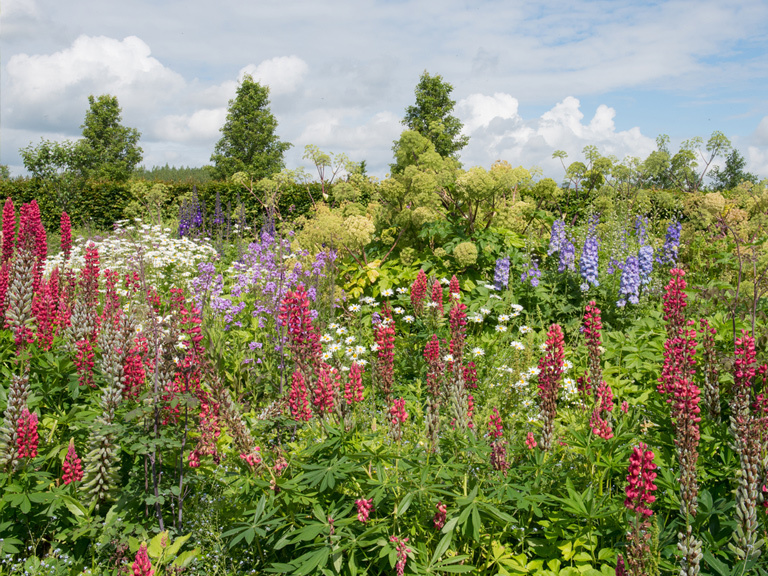 The year-long border which offers interest throughout the year is never going to work visually. It’s far better to pick plants that will perform in one season only - whether it’s spring woodlanders, or summer performers, or taller late-flowering perennials. Then you can extend the season by adding in later or earlier-flowering plants and that will give you six months of interest. Woodland borders, which major between February and May for instance, could have August-flowering hydrangeas such a H. paniculata ‘Annabelle’ or hardy fuchsias. 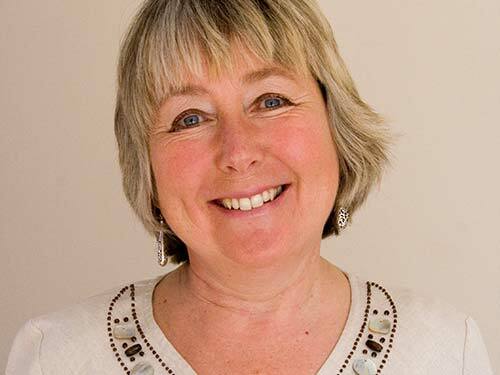 This will give two seasons of interest and in midsummer the foliage will still look attractive especially if you add hardy ferns such as polystichums, dryopteris and polypdiums. Summer borders peak between early May and late-July and often contain roses, peonies and lavender so they tend to be pastel in colour. 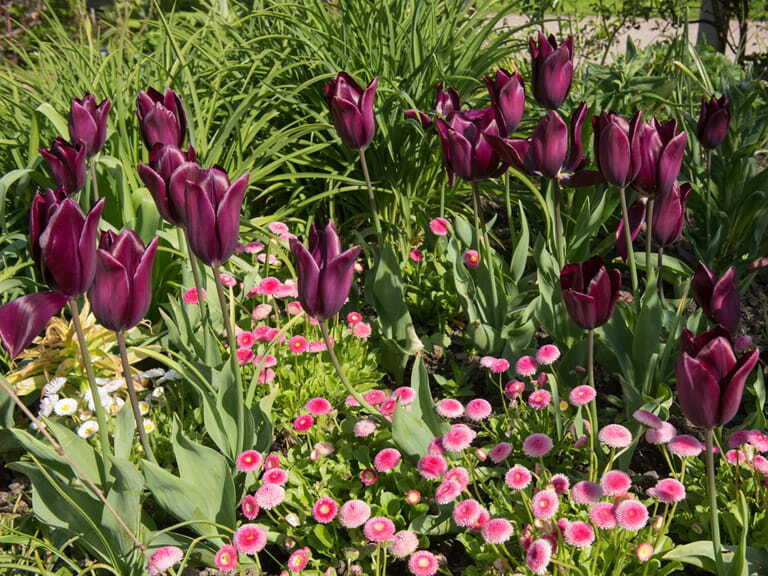 If you plant tulips, such as purple ‘Negrita’, pale-mauve ‘Shirley’ and terracotta ‘Ballerina,’ these will provide colour in April and May. You can also use later-flowering plants such as annual cosmos, ornamental salvias, Japanese anemones and penstemons. These will go on into late autumn and possibly longer. By doing this your summer border will be colourful from mid-April until mid-October. Autumn-flowering borders tend to contain taller plants and many of these are daisies such as asters, heleniums and helianthus. If you add tall grasses and leave your late herbaceous perennials intact until spring these areas will remain interesting throughout winter. Watch this video from Waterperry Gardens in Oxfordshire for a look at their herbaceous border throughout the year. Container-grown plants can be planted throughout the year with two exceptions. Never plant when the ground is icy and frosty - wait for better weather and tuck your plants up against the lea of the house. A west-facing wall is ideal. Don’t plant during hot dry conditions either, unless you can water regularly, because many modern composts dry out in these conditions. Once the root ball and compost dry out the plant suffers. Preparing the ground well makes the most difference to how your plants will do in the future. The roots need to stretch out from the rootball in the pot into the ground beyond. If you’ve good soil, that’s fertile and deep, all you need do is fork over the area and then plant. Make sure you water the plants well in their first growing season, should dry weather occur. 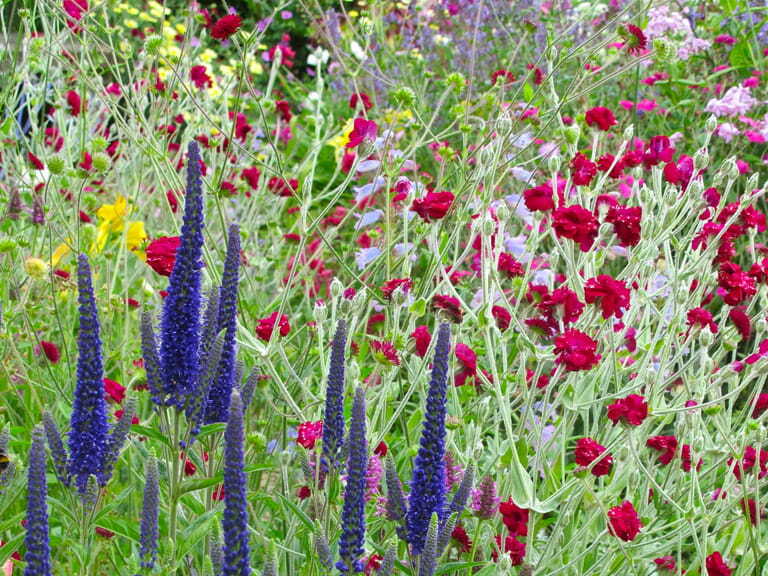 Once you’ve made your choice and the plants have arrived lay them out in the border and arrange them. Give them enough space to develop remembering that a larger plant will need space. Smaller plants will need less space. Don’t arrange them strictly to height, or your border will look like guards on parade. If there’s a tall airy plant or grass it could go near the front and create a veil. Avoid making round blobby blocks because these will not allow the eye to flow. Try to weave your plants through the border and there are several ways of doing this. You can create a ribbon effect by curling a line of plants through the border, or you can form a wavy triangle that disappears back into the border. Placing one plant away from the main group deceives the eye and makes the border look larger than it is. It’s important to mix the textures by adding plants with a vertical presence such as kniphofias, verbascums, veronicastrums and aconitums. Or you could use upright grasses such as Calamagrostis x acutiflora ‘Karl Foerster’. Verticals, plants that rise up, connect the ground to the sky above and break up the monotony of lots of mounds, the natural profile of most perennial plants, creating extra drama and interest. 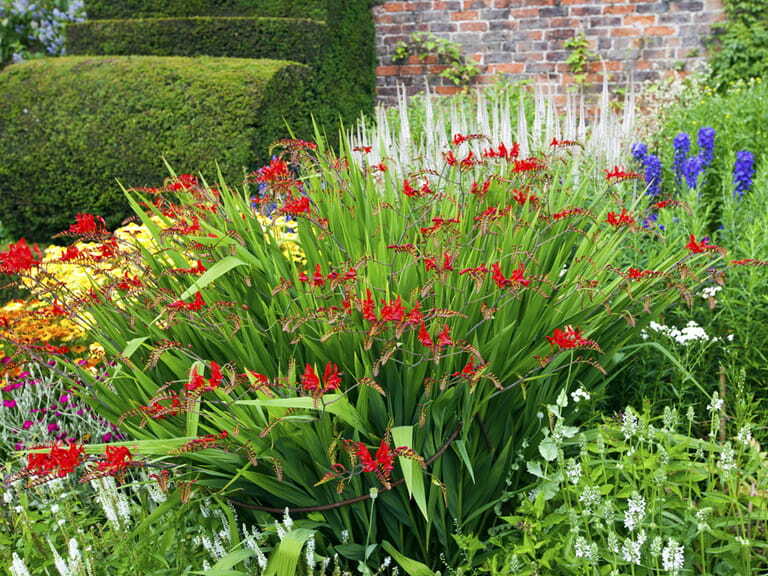 Sword-shaped foliage also has the same effect and some of the larger crocosmias, such as Lucifer, punctuate a border to great effect. Add one large-leaved bold plant or one in a strong colour if you can. Cotinus coggygria ‘Royal Purple’, for instance, will inject a blast of burgundy-red foliage that sets off neutral grasses making the border much more colourful. If you discover a good combination don’t be afraid to repeat it - it will add more continuity. 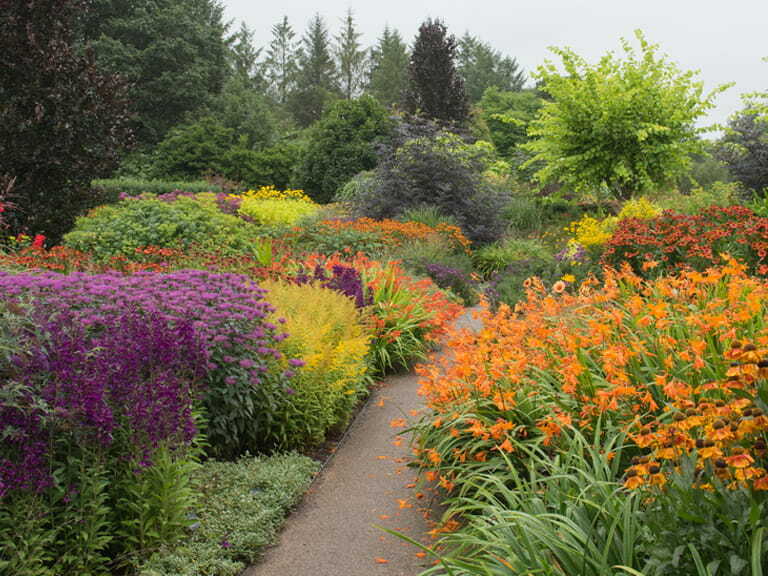 A perennial border will need some maintenance, such as dividing some perennials every few years and deadheading after flowering. Some seedheads can be left for architectural interest, but watch out for certain varieties, such as sanguisorbas, as they can self-seed quite freely. Find out the rules about when and how to divide perennials and the post-flowering care of perennials.